Dr Alexander Lippisch, one of the most influential aircraft designers of the 20th century, photographed after World War 2. German interest in flying wings and tailless aircraft pre-dates powered flight, although the most important early designer to set out specific rules for this type of aircraft was Hugo Junkers (1859-1935) who had spent the first half of his life working as a very successful heating appliance design engineer. 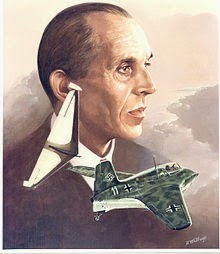 During his spare time, Junkers developed advanced aircraft concepts and in February 1910, he filed a Patent (253788) for a powered flying wing aircraft that represented a significant advance in aviation design. Known as a Nurflugel (wing only) aircraft, Junkers recognised the advantages of housing crew, engines and payload within the wing. Once the design had been registered, Junkers established an aircraft design bureau at his water heater factory in Dessau and this led to small-scale manufacturing. Although the Nurflugel was too far ahead of its time to be built, Junkers began to produce technical innovations that found their way into conventional aircraft, such as all-metal construction. World War 1gave the company a significant boost with Junkers building hundreds of warplanes in association with Fokker and becoming established as a major manufacturer. In 1924, Junkers produced plans for a giant airliner capable of carrying 100 passengers over long distances, but it was too advanced for practical development. But some elements of this concept were used in the Junkers G.38 transport aircraft which flew in 1929 and became the world's largest land based aircraft. 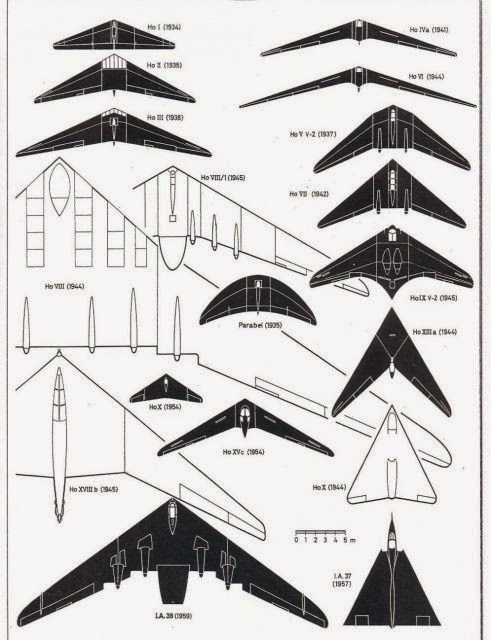 At the beginning of the 1930s, Reimar Horten (1915-1994) and his older brother Walter (1903-1998) started work on their first tailless glider called the Ho1. Apparently, this project received their parents' full support and some of the construction took place in their dining room. The Ho1 was followed by the Ho2 in 1934 and during the following year was upgraded by the addition of an 80hp (59kW) Hirth HM60R engine connected to a rear mounted pusher propeller with a drive shaft. This aircraft was flown by the well-known test pilot Hanna Reitsch (1912-1979) on 17 November 1938, who was quite critical of the design. Nevertheless, her involvement with the project was sufficient to encourage the construction of a larger design called the H03 and it would eventually secure official government interest that would lead to the most sophisticated experimental aircraft produced during World War 2. Another early aviation pioneer was Alexander Martin Lippisch (1894-1976) who witnessed a demonstration flight by Orville Wright at Berlin in September 1909. This experience made a lasting impression on the 14-year-old Lippisch and, having served in the Luftstreitkrafte (Imperial German Army Air Service) during World War 1 (as an aerial photographer), he then secured a job with Zeppelin and later Dornier as an aeronautical designer. During his spare time, Lippisch produced plans for gliders and the well-known glider pilot Gottlob Espenlaub built a fullsized aircraft from one of his designs in 1921. This would be followed by dozens of different tailless designs and by 1925, Alexander Lippisch had become Director of the Technical Department at the Rhön-Ros itten Gesellschaft (RRG), which later became the German Research Institute for Soaring Flight (Deutsche Forschungsanstalt fur Segelflug DFS). Lippisch now began work on his first powered aircraft called 'Storch' (Stork) and undertook development of the delta wing. 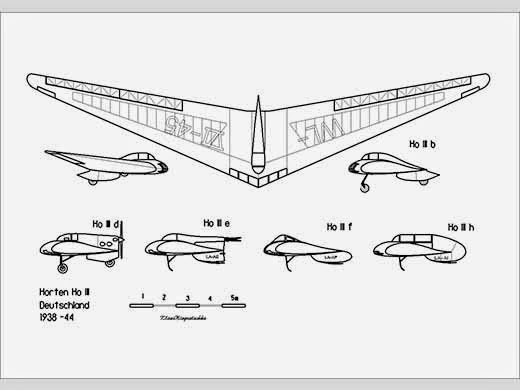 He is credited with coining the term 'delta' for this type of aircraft, having taken it from the three-sided Greek letter and not surprisingly, his first full-sized delta wing design was called Delta I. A series of aircraft developed from the Storch and Delta followed, with Lippisch eventually vacating his position with the DFS to join Messerschmitt in 1939 where he worked on a rocket powered tailless aircraft.